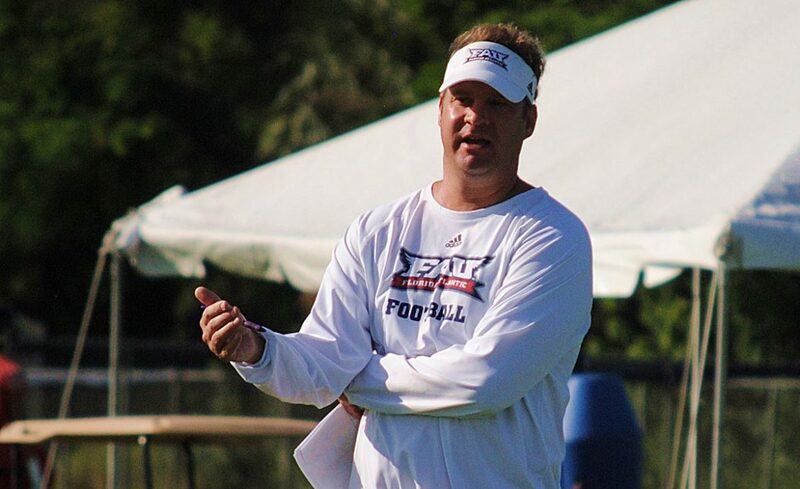 BOCA RATON – FAU coach Lane Kiffin spent the past week delivering two divergent messages. He ensured his players knew they are talented enough to beat No. 7 Oklahoma in Saturday’s season opener provided they limit mistakes. To everyone else, Kiffin tried to temper expectations that have grown progressively higher and at times irrational as the season approached. FAU travels to Norman, Okla., as a three-touchdown underdog. A playoff team last season, the Sooners are the favorite to win the Big 12. Yet over the past couple weeks FAU became the trendy pick nationally to pull a Week 1 upset. No team scored more points than Oklahoma last season. No team average more than the Sooners’ 580 yards per game. “This is as hard a test as you can get, playing what last year in a lot of statistics was the No. 1 offense in the country,” Kiffin said. Oklahoma posted those video game statistics with Heisman Trophy-winning quarterback Baker Mayfield at the helm. With Mayfield now a Cleveland Brown two-sport athlete Kyler Murray takes over the controls of the Sooners’ booming offense – and he has plenty of tools at his disposal. 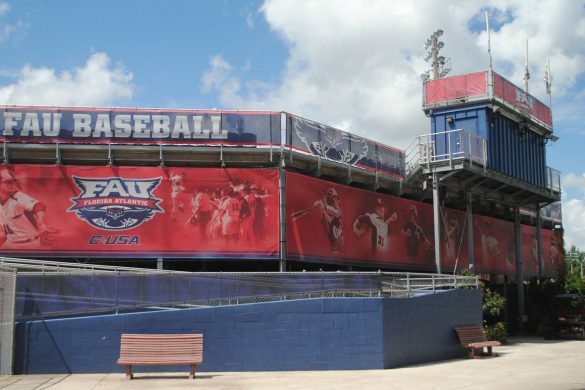 FAU heads to Norman riding a 10-game winning streak, second longest in the nation. The Owls won 11 games in 2017, captured their first Conference USA title and played in a bowl game for the first time in a decade. It was the kind of season both players and fans had been waiting for. 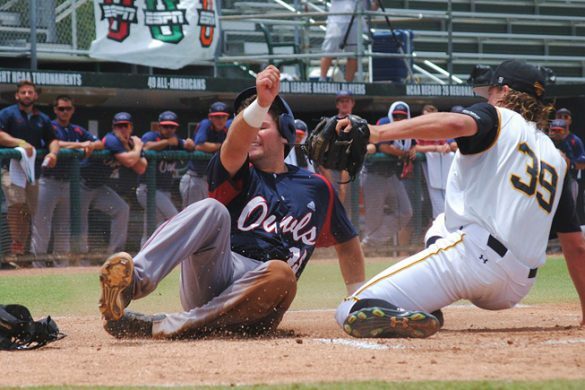 While it would be easy to attempt to recapture the magic from last season, the Owls say they aren’t focused on last year’s accomplishments. 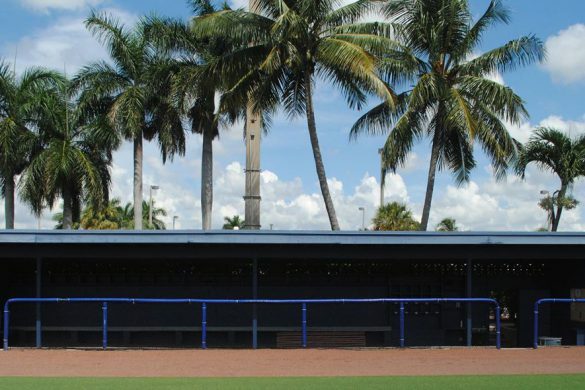 Key for FAU: Start fast. Oklahoma features a high-powered offense that will bury teams early if allowed to do so. FAU’s defense is good, but the Owls will give up points against the Sooners. Everyone does. But a couple of early stops combined with a score or two offensively should position the Owls for a competitive fourth quarter. Key for Oklahoma: Get Kyler Murray into an early rhythm. Like FAU, Oklahoma will feature a new quarterback in 2018. Murray replaces Heisman Trophy-winning signal caller Baker Mayfield. 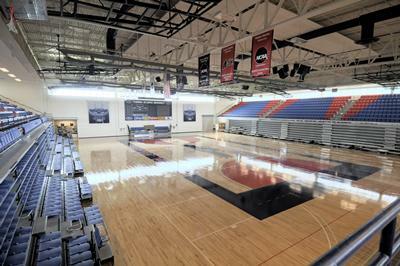 FAU will try to disrupt and confuse Murray with various pressure packages. If Murray settles in early, it could be a long day for the Owls. Kickball: Aside from the quarterback battle, the biggest question mark for FAU heading to Norman is its kicking game. Redshirt freshman Vladimir Rivas will handle place kicking duties, while true freshman Sebastian Riella takes over as punter. Replacing kicker Greg Joseph, the Owls’ career scoring leader, is a tall task for Rojas. The most noticeable difference will be on kickoffs, which Joseph frequently boomed through the end zone. Rojas’ kickoffs this fall rarely crossed the goal line. “We have confidence in them but obviously when guys are new at something there’s always a risk,” Kiffin said of Rojas and Riella. Wide Open: On Wednesday Kiffin reiterated his displeasure with the performance of FAU’s wide receiver unit. Injuries disrupted the unit early in camp, and the Owls are still struggling to line up correctly. Jovon Durante, who caught two touchdowns against Oklahoma as a West Virginia Mountaineer, will make his first start at one wide receiver spot. JUCO signee DeSean Holmes surpassed DeAndre McNeal at the other outside spot. Willie Wright, who led the Owls in receptions and receiving yards last season as a true freshman, returns as the slot receiver. 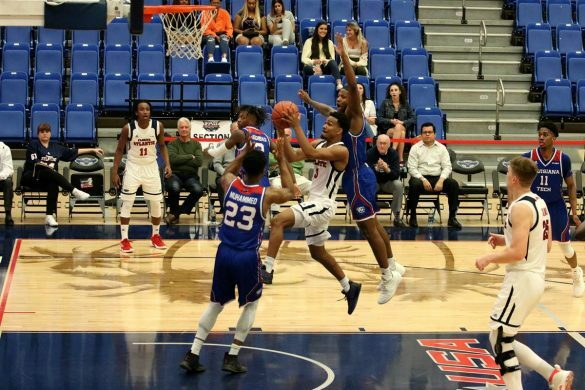 “They don’t have to stop me, they have to stop the whole team as a unit because it’s not just about me, it’s about the whole team playing together,” Wright said. Ungracious Hosts: Oklahoma doesn’t often lose in Norman. 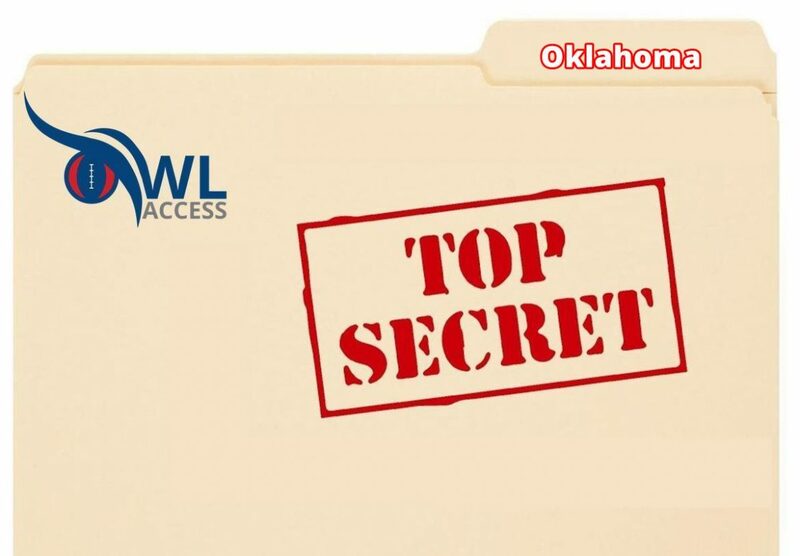 ESPN West Palm’s Brian Rowitz dug up this stat: Over the past 19 seasons Oklahoma has more Big 12 titles (11) than it has home losses (10). BOCA RATON — The long-awaited showdown between two of the brightest offensive minds in college football is finally upon us. Coach Lane Kiffin and his FAU squad is in for what looks to be a high-scoring affair in Norman tomorrow, as both the Owls and Lincoln Riley’s Oklahoma Sooners ranked top-five nationally in total offense last season. It’s the dawn of the Kyler Murray era for Oklahoma. The dual-sport star comes into the year with sky-high expectations after spending 2017 as the heir apparent to Heisman Trophy-winner Baker Mayfield. This will be Murray’s final collegiate season before joining the Oakland Athletics, so the pressure is on for him to pick up where his predecessor left off in taking the Sooners to the College Football Playoff. Oklahoma’s passing game should be deadly once again this season after ranking third in the country in yards per game (361.8) in 2017. Receivers Marquise Brown and CeeDee Lamb are bonafide stars on the outside, and Rodney Anderson is one of the most productive pass catchers from the running back position in all of college football — averaging 16.5 yards a catch on his 17 receptions. FAU may have an advantage defensively over No. 7 Oklahoma, which gave up 27.1 points per game in 2017, but will be tested in front of an explosive offense and raucous crowd in Norman for the season opener. Riley led the Sooners’ offense to the top spot in the nation in his first year at the helm, but loses some key pieces that helped make that possible. Stalwart left tackle Orlando Brown Jr., an All-Big 12 selection each of the past two seasons, is now a Baltimore Raven, no longer protecting the blind side in Norman. A player who was seemingly Oklahoma’s glue-guy offensively is gone as well in H-back Dimitri Flowers. Flowers’ versatility in being able to open up lanes as a run blocker as well as working as a dependable receiver is gone, and there isn’t a clear replacement in line. Schematically, Riley spreads the field – often playing four wide – to both open up an aggressive vertical passing attack and lighten the box for his running game. 24 Rodney Anderson, R-Jr, RB: After splitting the rushing workload with Trey Sermon and Abdul Adams early, Anderson exploded in the latter half of 2017, finishing with 18 total scores on seven yards a touch. The 6-foot-1, 220-pound workhorse back is a true three-down talent that is capable of both running nimble routes out of the backfield and burying would-be tacklers with power. 71 Bobby Evans, R-Jr, OT : He resided under the massive six-foot-eight 345 pound shadow of the aforementioned Brown Jr. the past two seasons, but his strong play shouldn’t have been overlooked. Evans possesses the same physicality of his former bookend tackle, Brown Jr., but is more polished in technique and can move better when dealing with speed rushers and getting the second level in the ground game. He allowed only 13 pressures a season ago per Pro Football Focus, second best among returning Big 12 tackles. 80 Grant Calcaterra, So, TE: With standouts Marquise Brown and CeeDee Lamb lining up wide, defenses can’t afford to pay much attention to the middle of the field. Tight end Mark Andrews feasted on that opportunity last season. He amassed 958 yards and eight touchdowns in his final year as a Sooner, and his understudy, Calcaterra is next in line to replace that production. Riley’s offense treats tight ends like an extra slot receiver, and the athletic six-foot four 240 pound California native is tailor made for that role. In true Big-12 fashion, the 2017 Sooners were largely pedestrian on defense – ranking No. 67 nationally in yards allowed per game (394.9). They look to turn it around in 2018 behind the growth of linebacker Kenneth Murray, who became the heart of the unit as a freshman. The Sooners are multiple defensively but tend to lean toward a four man front. 9 Kenneth Murray, So, LB: Murray burst onto the scene in his first collegiate season of 2017, quickly becoming a stout run-stuffer for the Oklahoma defense – ranking third on the team in tackles (68) as a freshman. His immense sideline-to-sideline athleticism helps him both snuff out opposing ground games and keep up in pass coverage. 44 Brendan Radley-Hiles, Fr, DB: It may be asking a lot for a freshman to take lead in the secondary, but given Oklahoma’s lack of talent in that area and Radley-Hiles tantalizing talent, it is definitely in the cards. 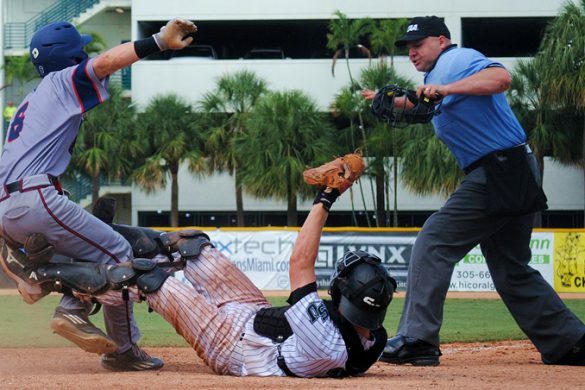 The Bradenton product was rated the No. 5 cornerback in the nation coming out of high school this past recruiting cycle and figures to make an immediate impact from his nickel cornerback spot. 19 Caleb Kelly, Jr., LB: A top recruit in 2016, Kelly’s play at Oklahoma hasn’t quite lived up to expectations thus far. He is transitioning to inside linebacker after playing outside his first two collegiate seasons, giving him a better opportunity to chase the football and use the speed and downhill instincts which made a blue-chip high school prospect. 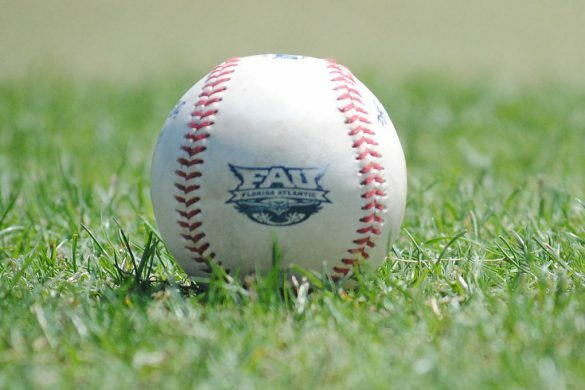 BOCA RATON – FAU will upset Oklahoma. That’s a short, powerful sentence that’s appeared all over Twitter over the past couple weeks. It’s a conversation starter often employed by fans and prognosticators who have never watched Florida Atlantic play and often spell “FAU” with an “I”. But, hey, when it comes to predictions it’s go big or go home, right? 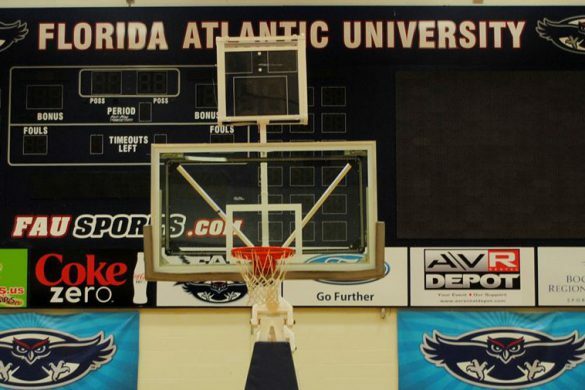 At OwlAccess.com we’re not going to predict the outcome of FAU’s season-opener at No. 7 Oklahoma. That’s not our style. 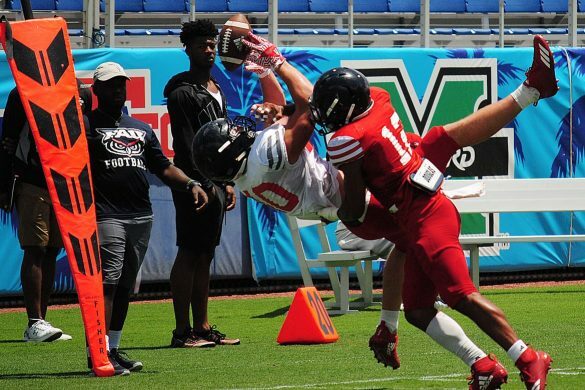 But having been regulars at FAU fall camp, scrimmages and Oklahoma prep, we do have some informed opinions as to what we think could happen on Saturday. Here are this week’s Bold FAU Predictions. CHUCK KING: The quarterback who starts for FAU at Oklahoma won’t be the one who finishes the game. He also won’t be the one who starts against Air Force. Lane Kiffin has yet to name a starting quarrterback. De’Andre Johnson had the biggest head start in the three-way QB competition, having played briefly last season. While the Owls rotated the three QBs during team portions of practices, Johnson often enjoyed the first shot with first team. 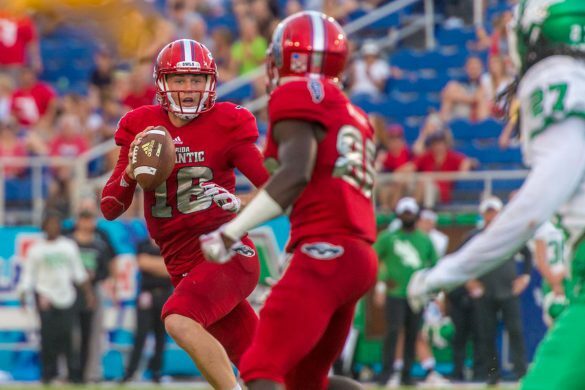 One FAU player characterized Johnson as the “alpha” of the QB unit. But over the past two weeks Chris Robison and Rafe Peavey have outperformed Johnson. Robsion is the most physically talented. 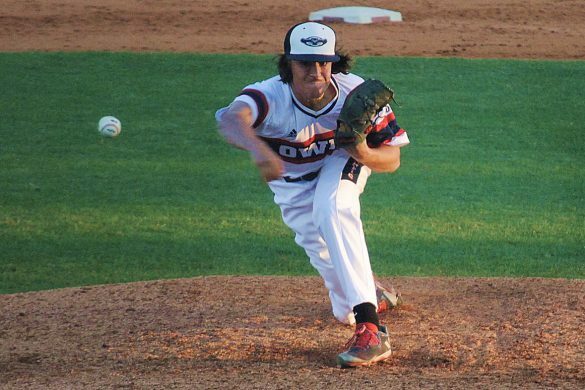 Peavey is an accurate passer and seems to have a surprisingly solid grasp on the Owls’ offense. Expect all three to play against Oklahoma. If Robison shows he can play within the framework of the offense with too much freelancing, he’ll be the starter moving forward. He’s the Owls’ quarterback of the future. But the Owls didn’t bring in Peavey to sit. He physically resembles Jason Driskel, last year’s starter at FAU. 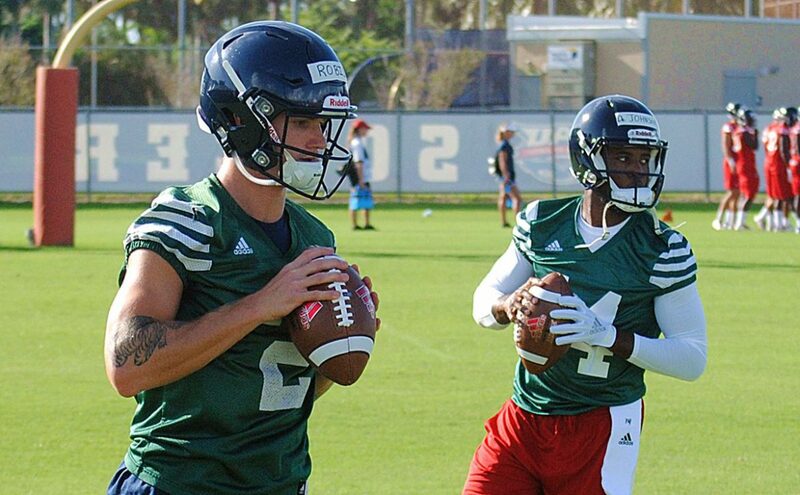 If Peavey demonstrates a grasp of the offense similar to that of Driskel’s, he’ll be the FAU quarterback of the near future – as in the starter for the next couple of weeks. As a bonus, with Lane Kiffin still dissatisfied by the wide receiver unit as a whole, the tight ends will have a big day, with either Harrison Bryant or John Raine – and maybe both – catching a touchdown pass. WAJIH Al-BAROUDI: Wide receiver Jovon Durante hauls in 80-plus receiving yards and a touchdown. Willie Wright, the Owls’ leading receiver from a season ago, faces a tough matchup this week in highly touted nickel cornerback Brendan Radley-Hiles. But outside of the promising freshman manning the slot, the Sooners don’t have much firepower elsewhere in their secondary. That opens the door for a huge showing from Durante. In a game expected to be fast-paced and arcade-like offensively, someone has to be the recipient of that increased pass game volume. There is a good chance that player is Durante, who has found success against Oklahoma in the past — scoring a touchdown in each of the two games he has played in against the Sooners while a West Virginia Mountaineer. 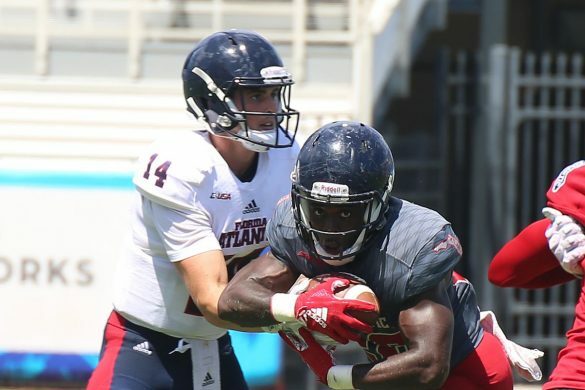 KING: FAU will find a way to pressure first-year starting quarterback Kyler Murray, and reserve linebacker Andrew Soroh will record the first sack of his career. Soroh moved from safety to linebacker this offseason and has truly impressed with his pass-rushing skills. It’s Soroh’s senior season and he wants to prove against top competition that there’s a place for him at the next level. During the offseason Soroh dedicated himself to becoming a pass rusher and even though he’ll begin the season behind Rashad Smith on the depth chart, that dedication pays off on Saturday. 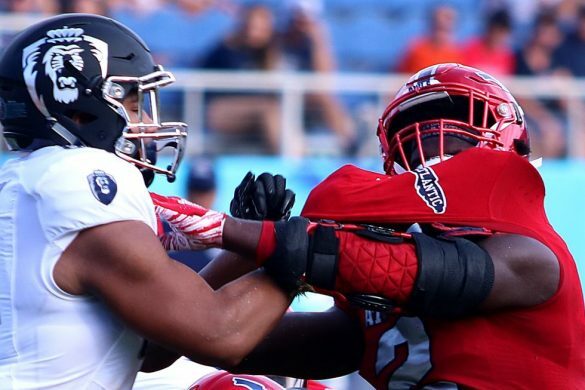 Another non-starter, defensive end Kain Daub, also gets his first FAU sack. AL-BAROUDI: FAU picks off Kyler Murray twice. There is no questioning Murray’s athletic prowess, but the former five-star recruit has yet to prove he can consistently take care of the football. The dual-sport star tossed seven picks in eight appearances for Texas A&M in 2015, his instant-highlight ability both as a runner and a passer marred with inconsistencies. Offenses tend to start slower than their defensive counterparts in the early portion of the season – that is especially the case for teams with turnover at the quarterback position like Oklahoma, which is moving forward without Baker Mayfield. Murray is an extremely talented player and will likely be in the Heisman conversation by season’s end, but it’s not out of the question for him to have some hiccups in his first significant start in Norman. KING: FAU will win 10 games this season and fans will somehow consider 2018 to be a disappointing season. Kiffin spent the past couple weeks trying to temper expectations with regard to his football team. What Kiffin understands that other people seem intent on ignoring is that winning 11 games is difficult, and what the Owls achieved last season was remarkable. Entering 2018 the Owls have two new coordinators, no starting quarterback as of yet, and a lack of depth at many offensive positions. AL-BAROUDI: The Owls finish undefeated in conference play for a second consecutive season. After posting an absurd plus-201 point differential against Conference-USA teams last season, coach Lane Kiffin’s team – which remains largely intact from 2017 – could conceivably regress and still be capable of running through the meat of its schedule with relative ease. The one game that could trouble FAU is a Thursday night showdown with last season’s conference runner-ups, North Texas. Logistics aren’t in the Owls’ favor in that Nov. 15 contest. They have only four days between games to prepare for the Denton road trip, and the kick-off is set for 8:30 p.m. local time – which would be 9:30 p.m. in Boca Raton. FAU doesn’t have a single other game on the schedule with a kick-off later than 7:30 p.m.
FAU begins its season on Saturday at No. 7 Oklahoma amid a buzz the program hasn’t ever experienced. 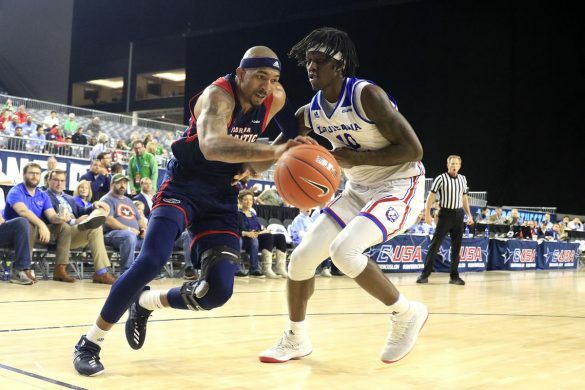 Riding a 10-game winning streak from last season and receiving votes in the Associated Press Top 25 poll, Florida Atlantic is the chic pick to repeat as Conference USA champions and even earn a berth in a New Years Six bowl. But first they must face the Sooners. 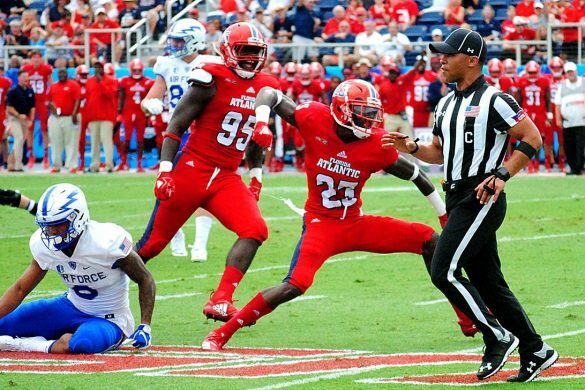 Can FAU begin the season by knocking off an FBS playoff team from last season? That’s one of the questions ESPN West Palm’s Brian Rowitz and our Chuck King discuss on the first 2018 regular season edition of OwlTalk – the first and still best podcast covering FAU football. Along with trying to find a quarterback, FAU coach Lane Kiffin spent the past couple weeks attempting to temper the expectations of FAU fans prior to the Owls’ trip to Norman. That hasn’t stopped some prognosticators from picking the Owls, a three-touchdown underdog, to knockoff the Big XII champs. And about that quarterback battle. Will it be De’Andre Johnson, Rafe Peavey or Chris Robison who starts against the Sooners? How many quarterbacks will play on Saturday? And will the quarterback who draws the start remain the starter in the second week against Air Force? 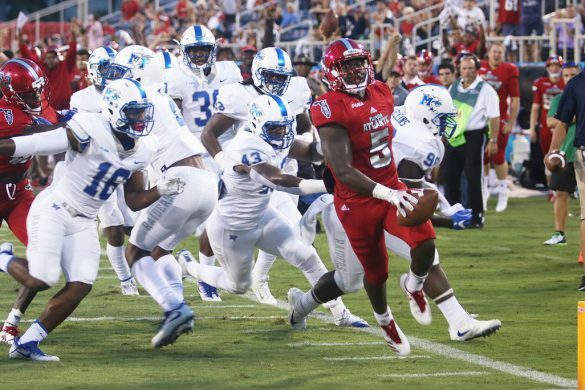 With the quarterback position unsettled, can FAU running back Devin Singletary do enough against Oklahoma to launch a true Heisman Trophy campaign? Finally, we broaden our view of the 2018 college football landscape to offer our predictions for the four teams who will eventually reach this year’s FBS playoff. 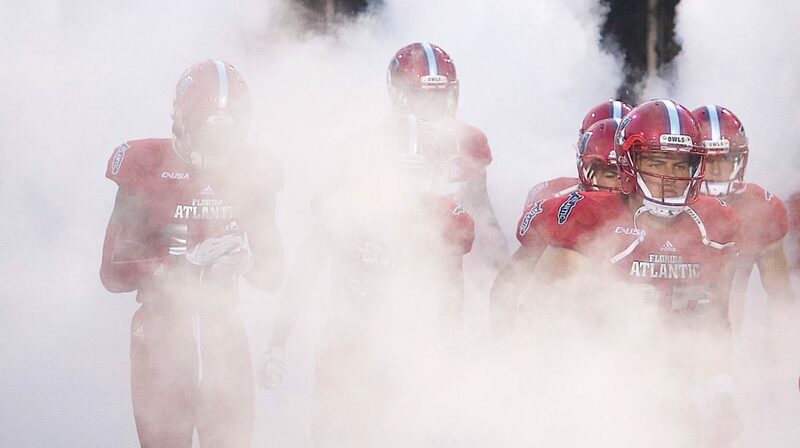 The FAU football season is nearly upon us. 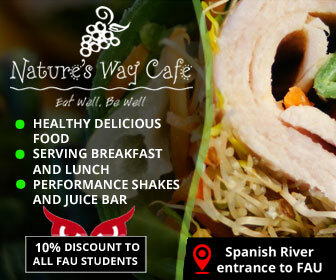 It’s what every FAU football fan has waited for. 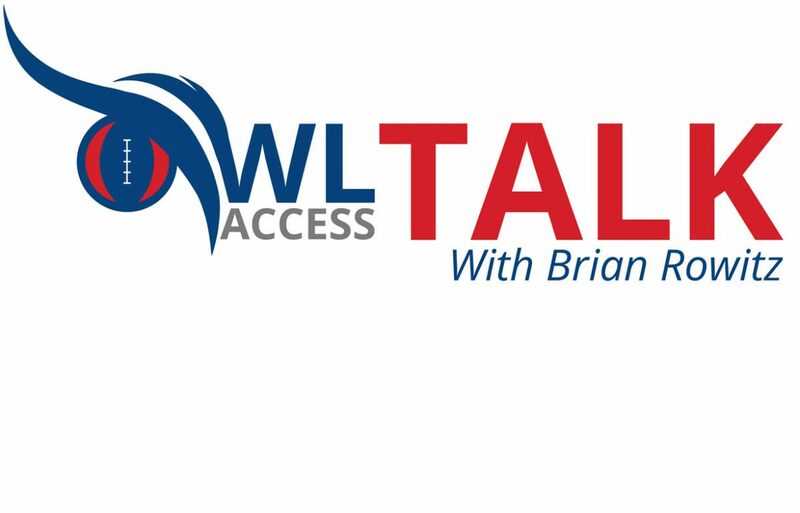 There’s no better way to prepare for the season opener at Oklahoma than settling down for 15 minutes of OwlTalk – the premier FAU football podcast. 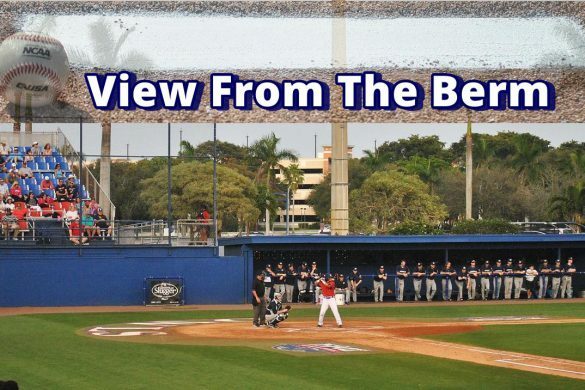 BOCA RATON – Following a year’s hiatus, the playbook is back for Florida Atlantic’s offense. When Kendal Briles came to FAU as Lane Kiffin’s first offensive coordinator last season, he brought with him the Baylor offense designed by former Baylor head coach Art Briles. It’s a scheme so simple, the younger Briles told players, that they didn’t issue a playbook. Briles spent one season – one prolific season – in Boca Raton before taking the same position at Houston. 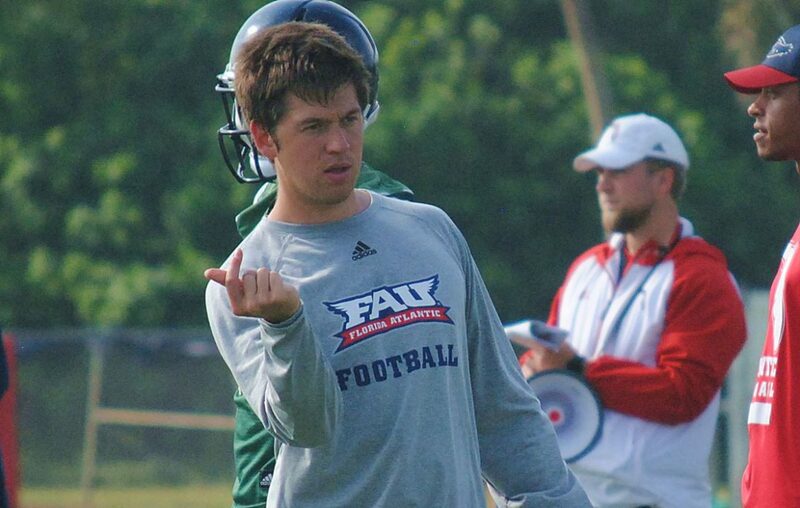 In his place FAU hired Charlie Weis, the youngest offensive coordinator in FBS history. 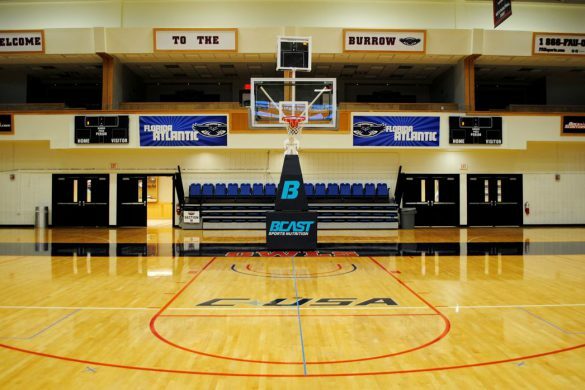 The Owls then set about creating a playbook. 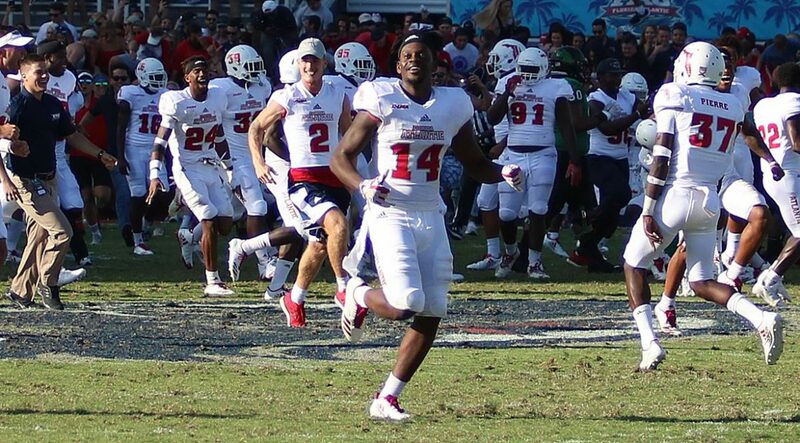 FAU averaged 498.4 yards and 40.6 points last season, both tops in Conference USA. Long regarded as an offensive guru, Kiffin incorporated aspects of Briles’ offense, most notably the high tempo and formation simplicity, into the volumes of offensive schemes and plays he banked from previous coaching stints that included stops at Alabama, Tennessee, and Southern Cal. He and Weis then put that offense on paper. Call it the blended Baylor offense. No one appreciated the physical playbook more during fall camp that graduate transfer quarterback Rafe Peavey. Coming from SMU, where the Mustangs’ offensive scheme and plays are given to players on an iPad, Peavey arrived at FAU with less than a month to learn the offense before Saturday’s season opener at No. 7 Oklahoma. He described FAU’s offense tome as a “huge playbook,” but says having it allowed him to pick up the offense quicker than many expected. With a decent grasp on the offense’s principles, Peavey began to master some of the offenses’ nuances once the Owls pivoted from fall camp to Oklahoma game preparation. “It kind of becomes easier because you start narrowing down the playbook and your play selection a little more to kind of target your play selection at what the defense is doing,” Peavey said. 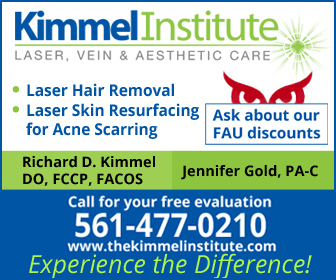 BOCA RATON – Last week at this time FAU coach Lane Kiffin conceded that the Owls current three-man quarterback battle may remain unsettled entering Saturday’s season-opener at Oklahoma, prompting him to employ a two quarterback system in Norman. On Wednesday, with only two practices remaining until opening kickoff, Kiffin expanded his potential playbook even further, admitting that all three might play. 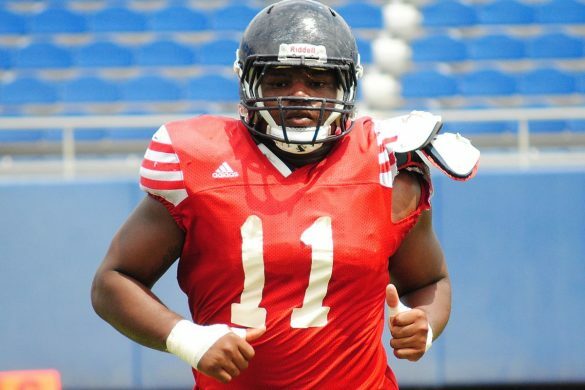 Redshirt freshman Chris Robison, graduate transfer Rafe Peavey and redshirt junior De’Andre Johnson, spent fall camp battling for that starting spot. All three continue to make their share of positive and negative plays. “Nobody has just totally outplayed the other guys, so they are all making mistakes, but at the same time no one’s really canceled themselves out to make it an easy choice,” Kiffin said. 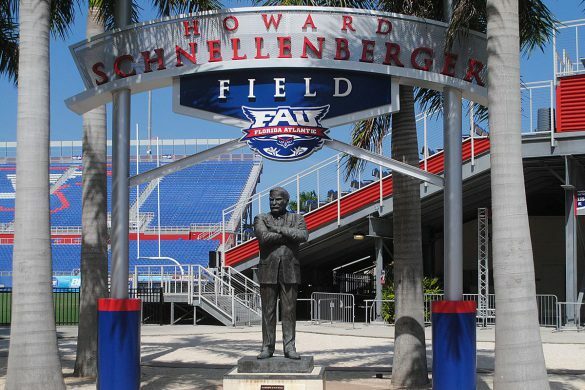 This past weekend Kiffin learned that, facing a similarly tough decision, program founder Howard Schnellenberger ultimately flipped a coin before the game to decide whether Jared Allen or Garrett Jahn would start the first game in FAU history. Unimpressed upon hearing the story last weekend, three more days of practice may have softened Kiffin’s stance on the merits of such a decision-making method. With a three-man battle a coin flip won’t settle the issue. “We’ll do rock paper scissors or something,” Kiffin said, presumably joking. Robison, the youngest of the signal callers in the battle, came on strong over the final weeks camp. 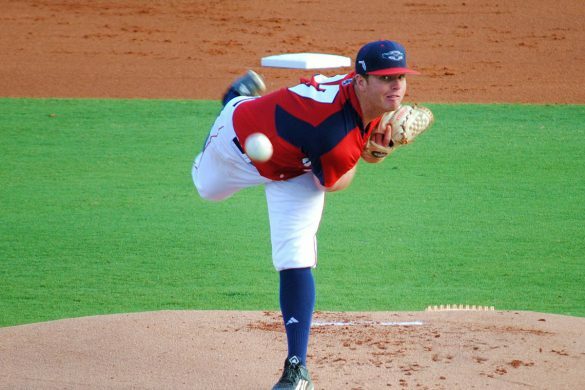 He transferred to FAU last summer after being dismissed from Oklahoma following an arrest for public intoxication. Kiffin said he doesn’t intend to try to protect Robison from what could be a raucous Sooner crowd by keeping the youngster on the sideline. 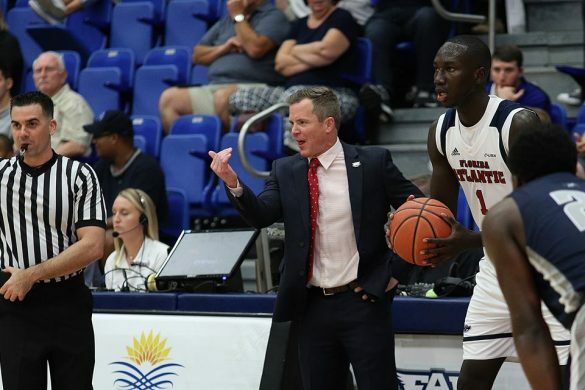 Peavey didn’t join FAU until after camp had already started, yet he’s impressed players and coaches with the rapidity with which he learned the playbook. 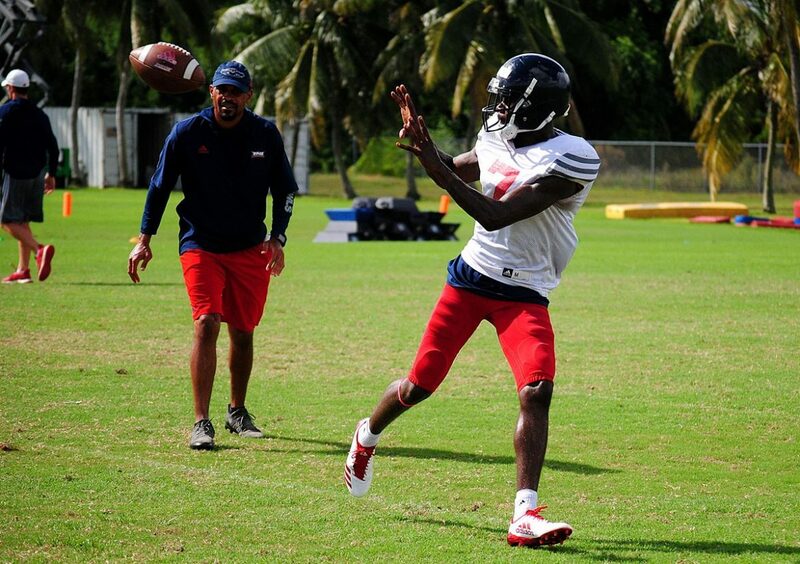 FAU defensive players consistently compliment the former Arkansas and SMU quarterback’s accuracy during practices. 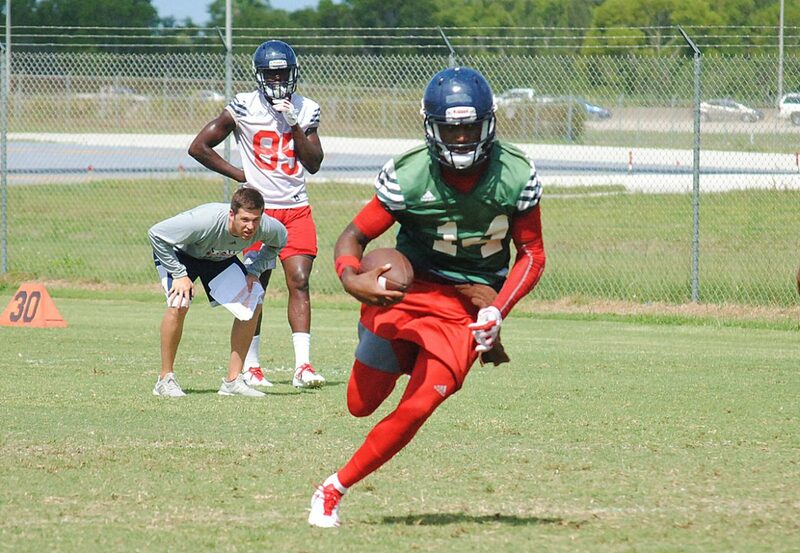 BOCA RATON – Playing the first road game of the year at Oklahoma is nothing new to FAU wide receiver Jovon Durante. He’s done it before. And he’s excelled. As a true freshman at West Virginia in 2015, Durante’s Mountaineers opened with three home wins before heading west to face the Sooners. Trailing 24-7 in the third quarter of what would become the West Virginia’s first loss of the year, Mountaineers’ quarterback Skyler Howard audibled out of a goal-line run. Howard liked the coverage he saw against Durante, called an audible, and lofted the ball to his freshman wide out on a fade route. Durante added another receiving touchdown against Sooners the following year and in two games against the Sooners he’s caught seven passes for 83 yards. Two of Durante’s seven career touchdowns came against the Sooners, a Top 10 team in both meetings. 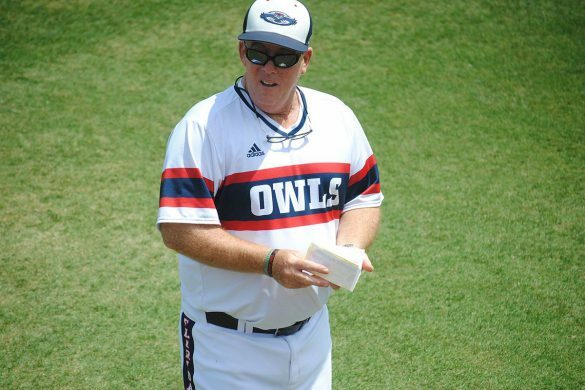 When Durante speaks about playing the Sooners – the Owls’ open the season on Saturday at No. 7 Oklahoma – it’s the voice of experience. Durante recognizes that this year’s teammates, and the Sooners for that matter, are a different from the teams which he played on and against, but the advice Durante has for this group of Owls who are largely unaccustomed to playing in such a boisterous venue hasn’t changed from the way he approached that first game in Norman. Durante sat out last season in compliance with NCAA rules after transferring to FAU and will be playing his first game as an Owl on Saturday. The Owls’ wide receiving plan this season, which calls for a heavy dose of Durante, hasn’t been executed smoothly this fall. Hampered by an undisclosed injury, Durante was one of a handful of wide receivers who missed time during camp – a group that also included starting slot receiver Willie Wright. On Tuesday both Durante and Wright said they are healthy and ready for Saturday. Their health is crucial for an offense in search of certainty. While the FAU quarterback battle drew much of the attention this fall – and coach Lane Kiffin has yet to announce who will start against the Sooners – over the past week Kiffin has called out the wide receiver unit for their lack of production. “He’s been on us a lot,” Wright said. Durante sees Kiffin’s criticisms as a positive. BOCA RATON – A safety most of his college career, Andrew Soroh now has that linebacker mindset. Want proof? He’s now focusing on sacks rather than interceptions. A redshirt senior, the 6-foot2, 220-pound Soroh began his move from safety to linebacker last season. By the start of spring Soroh has become a fulltime linebacker. 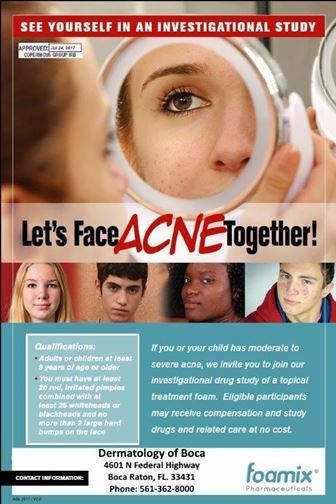 It’s a move that people around the program had discussed for a while. Always considered a big hitter in the secondary, Soroh notched 99 tackles during his first three years with the Owls, with 48 coming last season when he started more than half the Owls’ games at safety. Soroh has three interceptions in his college career but it still pursuing his first sack. Playing on the back line of the defense afforded Soroh an extra step or two to diagnose plays. Moving closer to the line of scrimmage hasn’t slowed Soroh down. As a linebacker, Soroh fits well into new defensive coordinator Tony Pecoraro’s attacking style of defense. Leaner than many linebackers, Soroh’s speed and ability to master the playbook allows Pecoraro to place Soroh at all three linebacker spots. He saw some time working alongside Al-Shaair with the first team defense during the fall, but will likely begin Saturday’s season-opener at No. 7 Oklahoma second on the depth chart behind returning starter Rashad Smith at weak side linebacker. Smith tied defensive end Hunter Snyder for FAU’s sack title last season with six. Soroh may be most effective this season on third downs, but not for the obvious reasons. Where players who move from the secondary to linebacker are usually more comfortable in pass coverage – and Soroh can cover backs or tight ends – he’s embraced the idea of using his speed to harass quarterbacks in the backfield. Pecoraro even said, perhaps only half jokingly, that the Owls could even employ Soroh as a stand-up defensive end in pass rushing situations. That’s the kind of talk Soroh now likes to hear. During the offseason Soroh picked the brains of starting defensive end Leighton McCarthy (who, at 6-foot-3, and 225 pounds, isn’t much bigger than Soroh) and backup defensive end Tim Bonner about pass rushing techniques from the end of the line. “Me having that speed to come off the edge and the rush moves that I have, I think I have a great advantage,” Soroh said. And that advantage, of course, should translate into sacks. BOCA RATON – As much as Lane Kiffin is looking forward to the start of the season, he isn’t excited about trying to stop Oklahoma quarterback Kyler Murray on Saturday. Murray will be behind center when Oklahoma welcomes FAU to Norman on Saturday for the season-opener for both teams. Last week Sooners coach Lincoln Riley officially named Murray the quarterback who will replace departed Heisman Trophy winner Baker Mayfield. Incredibly athletic, Murray signed with the Oakland A’s as an outfielder after the Athletics selected him with the ninth overall pick in June’s MLB draft. “He’s very difficult to deal with, much like over the years of playing the guys at Alabama that have given Alabama problems – the guys that are really good quarterbacks but on top of that they are unique speed athletes,” Kiffin said. Murray played in seven games last year mostly in mop up duty, completing 18 of 21 pass attempts for 359 yards and three touchdowns. He did technically start one game, against West Virginia, when Mayfield was suspended for the first two plays. Kiffin doesn’t belief Murray’s relative lack of experience will prove exceptionally beneficial for FAU. 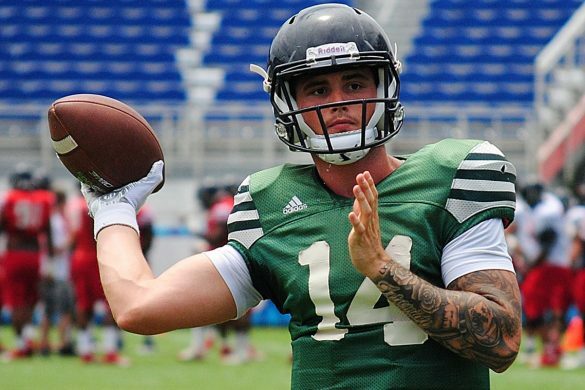 Like Oklahoma, FAU will also be starting an inexperienced quarterback. None of the three quarterbacks currently battling for the Owls starting job has ever started an FBS game. Graduate transfer Rafe Peavy, redshirt freshman Chris Robison and redshirt junior De’Andre Johnson all took snaps with the first team during Saturday’s mock game. “All three made plays,” Kiffin said. Kiffin has yet to name a starter and in recent days allowed for the possibility that more than one quarterback will play against Oklahoma. 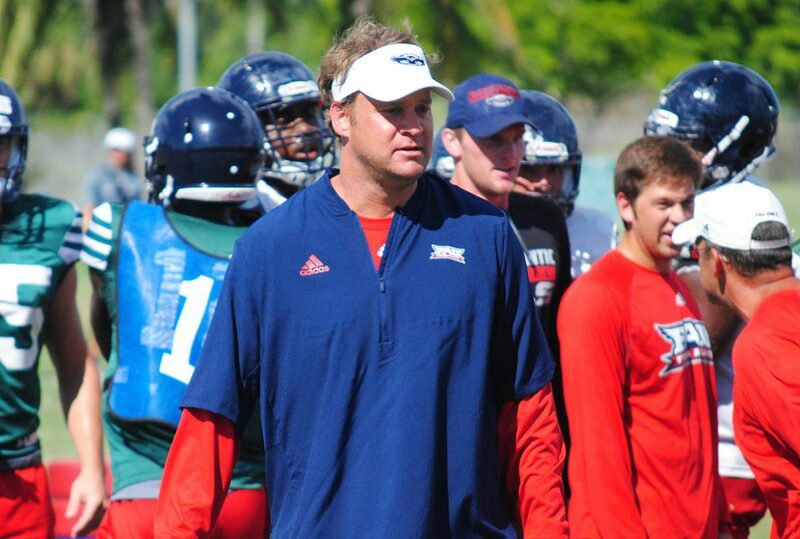 Should Kiffin elect to start Robison, that could add another layer of pressure to the youngest QB in FAU’s battle. Robison began his college career at Oklahoma but was kicked off the team following his arrest for public intoxication. BOCA RATON – Offensive coordinator Charlie Weis called the plays for the Owls’ offense during Saturday’s mock game scrimmage, and it sounds like he’ll retain those duties next Saturday when the games count. Throughout fall camp Kiffin said he hadn’t decided who would handle play-duties. Last season offensive coordinator Kendal Briles called the plays for the Owls. When Briles left for Houston during the offseason, Kiffin gave the now 25-year-old Weis, who had never served as a position coach during the season, the offensive coordinator job. Kiffin and Weis created the game plan for Saturday’s scrimmage as though they were facing opening-game opponent Oklahoma, with the first two strings on both the offensive end defensive depth charts facing a scout team designed to mimic what the Sooners do. “The game plan was done like a real game, but you’ve still got to call it,” Kiffin said. Quarterbacks Chris Robison, Rafe Peavey and De’Andre Johnson all took turns with the first unit. Kiffin didn’t see enough from any one signal caller to immediately name a starter. “I thought all three guys played well, so we’ll go back and watch it,” Kiffin said. FAU treated Saturday’s mock game as though it were a real game, right down to staying at a team hotel on Friday night and holding the normal pregame Friday night meetings. Kiffin hoped that approach would allow the Owls to work out some of the kinks that often come at the start of a new season, including substitution patterns, and special teams calls. The overall effort pleased Kiffin, whose Owls open their season on Sept 1 at Oklahoma. The Owls even had the opportunity to practice what they would do in a delay when lightning once again disrupted an FAU scrimmage or game.